As followers of this blog will know I keep a look out for new and interesting patents that become granted in the field of printed and plastic electronics. This field is forever expanding as new technologies are discovered that can be created by printing functional materials. 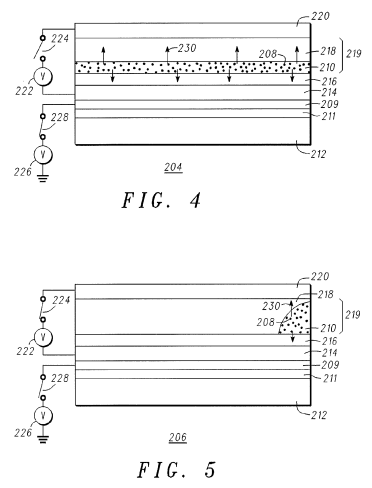 Recently I came across a patent granted to QD Vision Inc. that is basically a combination patent of quantum dot technology and electrowetting display technology to provide a low cost, low power display that can be read under a wide variety of conditions. Under good ambient light is relies on its reflective electrowetting display technology but as light levels are detected to drop below a critical level a UV backlight switches on (either via a sensor or manually) to activate a quantum dot (QD) light emitting display. The electrowetting colour cells and the quantum dots are chosen so that the colours match and provide a seemless transition between the two types of display technology. The patent is US8264777 and was published as a granted patent on 11th September 2012. As always it is the claims that define the invention but there is a lot of technical description that can be read from the main specification as well. 1. An electrowetting display, comprising: a plurality of transparent layers defining a cavity; a combination of a first fluid and a second fluid positioned in the cavity; first circuitry configured to be coupled to a first voltage source for selectively repositioning the second fluid in relation to the first fluid; a first plurality of quantum dots positioned within the second fluid; a light source disposed contiguous to the plurality of layers; and second circuitry configured to be coupled to a second voltage source for selectively causing the light source to emit photons to strike the first plurality of quantum dots. This helps us to realise that the quantum dots are included in the second fluid (the one that moves as part of the electrowetting action) and defines the way the technologies have been combined together. In the patent FIGS. 2-5 are schematic partial cross sections illustrating four operational states for an exemplary embodiment. The images show the electrowetting display in the two main states where the second liquid is either evenly spread over the whole surface (wetting) or at the side (non-wetting). FIGS. 2-5 are schematic diagrams of four states of a single level and a single pixel in which an electrowetting display 200, 202, 204, 206, respectively, includes QDs 208 disposed within an oil 210. Each of the FIGS. 2-5 comprise a reflective surface 211 deposited on a substrate 212. A ultraviolet (UV) light source 209 is disposed on a side of the reflective surface 211 opposed to the substrate 214 and is coupled to a voltage source 226 through switch 228 for selectively activating the UV light source 209. A transparent electrode 214 is formed over the light source 209. A transparent hydrophobic insulator 216 is formed on the electrode 214 for supporting the combination of oil 210 and water 218. A transparent electrode 220 is formed above and for containing the water 218 and oil 210 in a cavity 219. A (low frequency or DC) voltage source 222 is coupled between the electrodes 214 and 220, and is selectively applied by closing the first switch 224. When ambient lighting is sufficient, the ambient light entering the electrowetting displays 200, 202, 204, 206 is reflected by the reflective surface 211 back out, either through the oil, or not through the oil when the oil has been moved to the side. Note that when the oil contains a color pigment, the light reflected back out will be of that color. The QDs 208 may be activated, e.g., when ambient light is insufficient, to provide additional light exiting the electrowetting displays 200, 202, 204, 206. The QDs 208 will provide a light having a color depending on the diameter of the QDs 208. Preferably, when a colored oil is used, the QDs 208 will provide light of the same frequency (color). Combination patents are great ways for expanding a patent portfolio and also for ensuring that other companies don’t block you from exploiting your technology by generating their own combination patents. The key concern is always whether the combination is obvious to anyone skilled in the art. In this case there seems to be enough novelty in the way the technologies have been combined that the patent has been granted. The fact that the original application claims have not been significantly amended suggests that it went through the patent process quite smoothly. 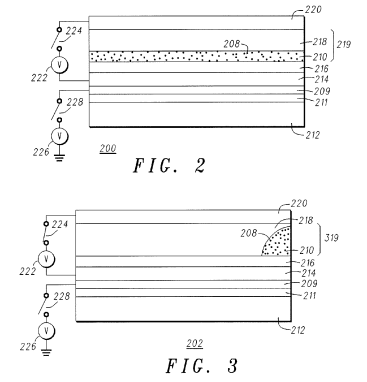 This patent was identified in a printed electronics search because various lithography processes, e.g., photolithography, electron beam lithography, and imprint lithography, ink jet printing, may be used to fabricate the light emitting device, and a printing process is preferred. In the printing process, the Freestanding Quantum Dots (FSQD) ink in liquid form is printed in desired locations on the substrate.